Tim Loesch is a leader in delivering products and information that help all of us and is well known to the MN and International GIS/LIS community. He has taught workshops at state conferences and spring events since they were first offered in 1991 and his workshops have been consistently the first to fill and the most highly rated. Tim has worked on several high profile projects including the DNR’s award winning Data Deli and more recently the 2003 FSA Imagery. He has written applications to improve the usefulness of GPS and GIS across the state - applications which he has made freely available to the GIS community. 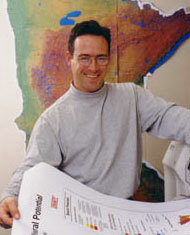 He did the data processing and cartographic work to produce Minnesota’s Wildlife Management Areas and the award-winning Land Use and Cover in Minnesota - A 1990’s Census of the Land. He has taught advanced GIS classes at St. Thomas for seven years and at the University of Minnesota for the past two years. 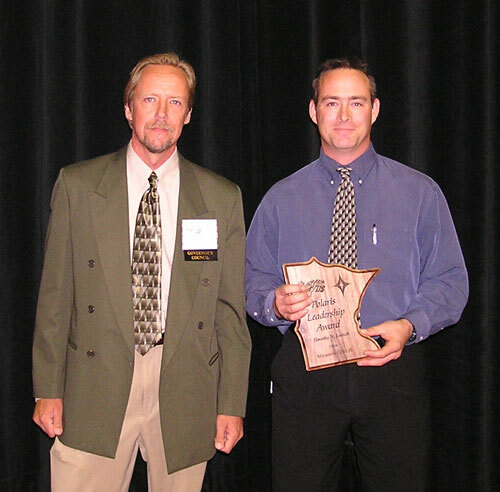 2004 Polaris Award recipient Tim Loesch with nominator Robert Maki.